The number of safety gate related injuries appears to rise year upon year. In fact, some experts claim the number of injuries occurring due to safety gates has quadrupled over the past 20 years. So, does this mean you should get rid of the gates completely? Not at all. However, it does mean you need to ensure you’re using them correctly. 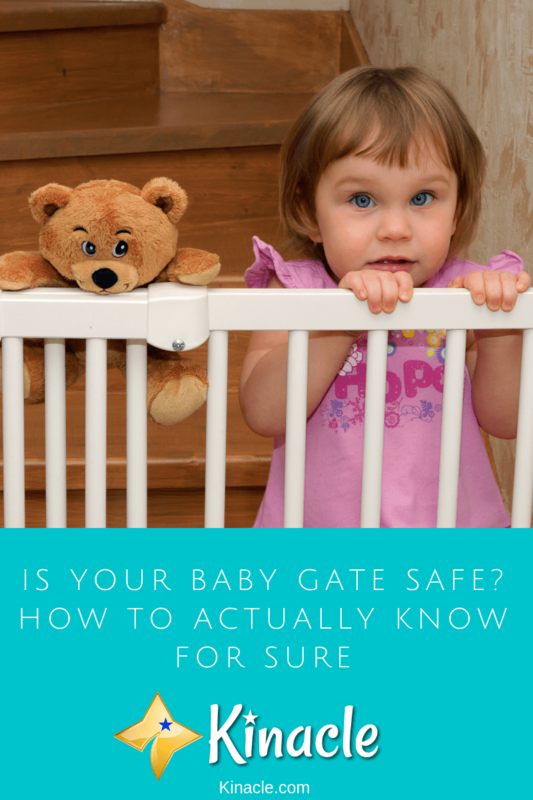 Here, you’ll discover how to ensure your baby gate is safe to minimize the risk of accidents. Does The Gate Meet Safety Standards? First and foremost, you need to ensure the gate matches relevant safety standards. Not all safety gates are made equal so it’s important to take your time to find the best ones. Ideally, the gate should be certified by the Juvenile Products Manufacturers Association. Products which do come with this certification usually feature a JPMA sticker on the packaging. It basically means the gate meets the voluntary safety standards of the association. Did you know there are several different types of baby gates out there? While all are designed to ultimately do the same job, you will need different types of gates for different areas of the home. For example, if you’re looking to add a safety gate to the top of the stairs, it should be hardware-mounted. This means they will be fully secured to the wall, eliminating the risk they’ll fall over if pressure is placed onto them. Pressure mounted gates on the other hand, should only be used at the bottom of the stairs or as a room divider. When it comes to fitting the gate, you should always follow the manufacturer guidelines. They may look pretty straightforward but miss a step and it could prove extremely dangerous to your little one. A good example of this is retractable fabric gates. Did you know that these types of gates need to be installed a minimum of six inches away from the top of the stairs? If you don’t, your child could fall under the gate if they push against it. Directions like this are always included in the manufacturer leaflet so be sure to follow it to the letter! When you buy a safety gate, you’ll notice they tend to come with plastic gate plugs. The trouble is, these are rarely strong enough to support the outward swinging motion of the gate. Instead, these types of plugs are designed to withstand downward pressure. This means, when used with a safety gate, they could end up popping out eventually. So, your best option would be to screw the gate into wood. If you have a baseboard, it would be a good idea to use spacers. Many parents have attempted to cut away the baseboard because they’re worried about drilling into it. However, there’s no need to do that if you use spacers. These are basically small blocks of wood which should ideally be the same thickness as the baseboard. Place them between the frame and the drywall and the gate can then be securely screwed into the wall. Sometimes, accidents occur not because of the way safety gates are installed, but because they aren’t placed in the right location. Don’t just put one at the top of the stairs. You’ll also need to put them between rooms and at the bottom of the stairs. When babies can crawl to the bottom of the stairs, they’re naturally going to want to explore. Attempting to crawl up the stairs could end in disaster. So, having a safety gate at the bottom of the stairs too is essential. You’ll want to avoid leaving a big gap underneath the gate. Some parents do this so that the family cat or small dog can climb under it. However, you need to remember, if your cat can get underneath the gate, so can your baby! It’s best to stick to leaving a gap no more than three inches between the gate and the floor. The internet is a wonderful thing and it can teach you how to make practically anything – even safety gates! However, as tempting as it may be, you should never make your own gate. The thing is, safety gates aren’t overly expensive anyway. Plus, they’re designed with specific health and safety guidelines in mind. When you make your own, you can’t guarantee just how safe it’s actually going to be. Although safety gates are relatively easy to put up, it could be worth using a professional service. You should be able to find a local company which can put the gates up for you. That way, you absolutely know they’re going to be secured correctly, giving you great peace of mind. Obviously if you have a small budget this may not be a viable option. However, if you can afford it, it is highly recommended you use a professional service. We’ve so far covered how to safely put a baby gate up. However, did you know it’s also important to know when to take them down? When your child is old enough to figure out how to use the gate, or climb over it, it’s time to remove them. This is because, climbing over the gate could lead to serious accidents; particularly if they’re attempting to climb over the one at the top of the stairs! Overall, safety gates are an essential tool every parent should invest in. However, if you want to avoid injury, it’s crucial you follow the advice above. Remember, not all baby safety gates are made equal. Therefore, it’s advisable you do your research to ensure you’re choosing a sturdy, reliable gate.